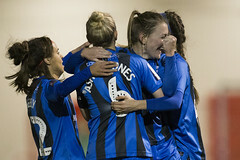 Gillingham Ladies kicked off the new calendar year with a win over Milton Keynes Dons Ladies at Chatham Town FC. 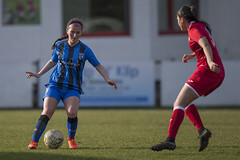 Goals from Breon Grant and Alice Bussey secured the three points for Gills after the FA Women’s National League’s winter break. Manager Jack Wheeler named two changes to the starting eleven from the final game of 2018, Ellie Manning and Emily Symonds dropped out for Grace Seely to return to midfield and new signing Bethany Powell to make her debut at full back. Gillingham Ladies started the game very brightly, Breon Grant had two efforts within the opening fifteen minutes. The first of Grants chances, a shot saved by Milton Keynes goalkeeper Sophie Shultz. 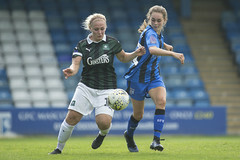 The woodwork denied the Gills forward the breakthrough, as Grace Seely played in a brilliant pass, Grant’s strike cannoned back off the upright. Keeping up the pressure Gillingham nearly added a second shortly after. Lauren George cut in from the wing to get into the penalty box. Her shot was a bit tame and straight at the keeper. MK Dons showed that they shouldn’t be out written yet. 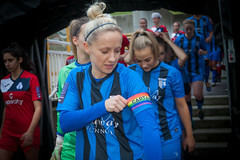 Kim Farrow dispossessed Daisy Monaghan and made a bursting run into the Gills’ penalty box. Lydia Huntly was alert and a great diving block sent the ball for a corner and denied a chance on goal. After the break, the visitors really came at the Gills, intent on getting back into the game. Kim Farrow struck an effort of the crossbar before Leah Cudone turned a shot wide for MK. An hour into the tie, Gillingham will of felt they should of put the game beyond doubt. Grant charged forward and got a shot on goal, to see the woodwork once again deny the forward. The rebound off the crossbar fell to George, but could not get her composure before rushing and striking the ball wide. MK weren’t about to let the tie go, Leah Littlechild latched onto the end of a through ball past the Gills defence and narrowly shot wide. 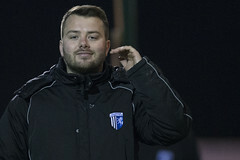 In the final ten minutes of the game, Gills had two chances one on one with the keeper. Firstly Grant played in a smart pass to see Bussey beat the defence, however a excellent last ditch challenge for a Milton Keynes defender duly stopped the forward from a clean strike on goal. Gills once again threatened when second half substitute Niamh Jestin broke through on goal, Shultz made a brave and brilliant block to deny the Gills. A nervy last few minutes for Gills, as they looked to hold onto their clean sheet. A frantic pinball in the box saw a goal line clearance, then Ellie Gough turned a shot past the post late on. As the whistle blew, it means Gills go nine points clear of the bottom two sides at the half way point of the FA Women’s National League season. Milton Keynes Dons Ladies: Sophie Shults, Leanna Doyle, Vicky Holland, Laura Bright, Charly Wright, Charley Clarke, Joanne Horwood, Alice Hughes, Leah Littlechild, Leah Cudone, Kim Farrow.